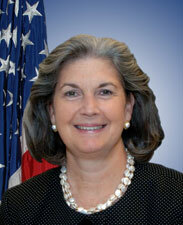 This year's L. Welch Pogue Award will be presented to Peggy Gilligan, Associate Administrator for Aviation Safety, Federal Aviation Administration. The award is being given in recognition of Ms. Gilligan's many contributions to advancing commercial aviation. Please read more about Ms. Gilligan here. We hope you can join us in celebrating her achievements. Guest names for name tags, recommendations to the Club for government invitees and other questions should be directed to Kathleen Duffy at (202) 508-8937, or via email, at: kduffy@crowell.com.